I've gone into full prep mode for Renee and Siena's birthday party–which is in a month (!). The girls love to help me cook in the kitchen, so we decided on a baking party. The challenge is always the same when I have a party at home: I want to make everything look cute without spending hundreds of dollars. Since the party will be small (I'm hoping we end up with 10 kids total) doing many of the projects won't be too labor-intensive. So, I'm going to share some of the DIY I'll be working on for the party. First thing–invites. I made the invites myself and will be sending them out in the next week or so. I'm pretty happy with the way they came out. My husband couldn't believe I did them myself! Here are a few tips to whip together your own invite. FIND INSPIRATION: Look at invitations that were done for similar themes, or just styles that you like. Look at actual parties. You might find an item that you want to focus on. 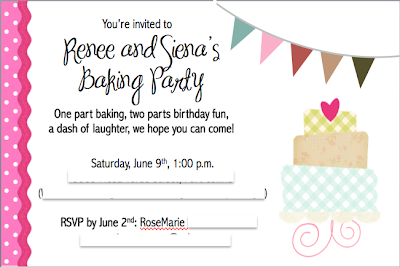 My inspiration for this invite and the general party decor comes from a baking party done by The Party Dress. I liked it because it wasn't the usual pink and white striped banner baking party. Using the bunting/pennant allows me to incorporate a small sweet shop area into the party, too. I also started an inspiration board on Pinterest that you can see here. FONTS: Have fun with this! There are some great resources for FREE fonts: dafont.com and Kevin & Amanda are two that I've used. Many bloggers often do roundups of great free fonts and where to get them. A few include: Eighteen25, Pizzazzerie and I (Heart) Nap Time. IMAGES: The quickest way to find the images you want–and can use–is by paying a very small fee for them. MyGrafico.com is the one I'm most familiar with. You can buy a set of digital art for about $5. I'm still mapping out my decor, but I just might buy some of their art for some wall decor I want to do. Or, if you're lucky, like I was for my invite, you can find some free art to use from a very generous blogger! After searching online for an hour, I came across pumpkins & posies. I used their FREE Happy Birthday digi scrap kit for my invite. What luck!! When you visit, look around–she's got some other great freebies on there! LAYOUT: As far as actually designing the invitation, go with the program you know best. Don't assume you need to design an invitation with a program like InDesign. I actually used Powerpoint to put my invitation together. I use it everyday for work, so I know it very well. I hope I've helped you find some new resources. Let me know if you have any other tips to share!